Multiple trampoline jumpers are a primary cause of “trampoline ankle,” according to a recent Canadian study, which also noted that, when two individuals are bouncing out of sync, they generate kinetic energy forces that produce a high-impact effect that can cause serious growth-plate injuries in children. Researchers at the University of Ottawa retrospectively reviewed case files of skeletally immature patients who sought medical care at a tertiary hospital between 2001 and 2011 and who had a trampoline-related injury and a physeal fracture of the medial malleolus. They evaluated circumstances leading to the injury, as well as treatment outcomes and complications. They identified 11 patients (mean age 11.8 years, seven girls) with medial malleolus Salter-Harris types III and IV fractures (MacFarland fractures) and collected information on how the injury occurred for 10. Nine of these children were bouncing on the trampoline at the same time as someone else when the injury occurred. The one jumper known to be a single user had been participating in competitive trampolining, which the authors noted likely would result in higher impact than regular recreational trampoline use. Seven children had Salter-Harris type III factures through the growth plate and epiphysis. Four had Salter-Harris type IV fractures through the growth plate, epiphy­sis, and metaphysis. Six required surgery. Multioccupant jumping generates kinetic energy forces, producing a high- impact effect that can cause serious growth-plate injuries. “In the ‘trampoline ankle,’ the injury actually involves the growth plate near the ankle and that is why this is a unique type of injury in kids and not adults,” said Paul Moroz, MD, a pediatric orthopedic and spine surgeon at Shriners Hospitals for Children in Honolulu, HI, who was senior author for the study while a member of the University of Ottawa faculty. The Journal of Pediatric Orthopaedics epublished the study in November 2015. Multiple jumping can occur on any type of trampoline—round backyard tramps with safety netting and protective padding, competition-grade rectangular equipment, and the wall-to-wall kind found at trampoline parks. This means all types can cause injuries due to the double-bounce effect, Moroz said. “I don’t think it is the type of tramp that is the issue, it is the number of people on the tramp at one time that is important,” he said. The Ottawa researchers pointed to a 2011 study in the Emergency Medical Journal that addressed the force and energy transfers that occur when two individuals of different sizes use a trampoline together. Those researchers concluded that a 176-pound adult bouncing out-of-sync with a 55-pound child will dramatically increase the load absorbed by the child’s lower limbs, resulting in forces equivalent to a fall onto a solid surface from a height of almost 9.25 feet. and 2011. More than a quarter (288,876) suffered broken bones, and more than one-third (35.7%) occurred in the lower extremity. The average age for those with fractures was 9.5 years, with nearly 93% of patients 16 years or younger. 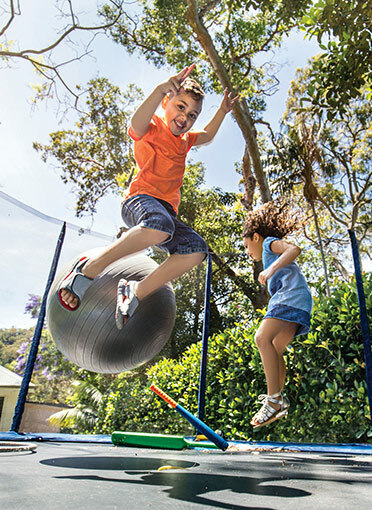 The Ottawa study authors said their results raise concerns about potential high-energy impacts generated by trampoline misuse. Blumetti F, Gauthier L, Moroz P. The ‘trampoline ankle’: severe medial malleolar physeal injuries in children and adolescents secondary to multioccupant use of trampolines. J Pediatr Orthop B 2015 Nov 19. [Epub ahead of print]. Loder R, Schultz W, Sabatino M. Fractures from trampolines: results from a national database, 2002 to 2011. J Pediatr Orthop 2014;34(7):683-690. Menelaws S, Bogacz A, Drew T, Paterson B. Trampoline-related injuries in children: a preliminary biomechanical model of multiple users. Emerg Med J 2011;28(7):594-598.